NEXT Architects recently completed the world’s first Rose Museum, a beautiful and sculptural building that blends traditional cultural influences with contemporary design. Located near the center of Beijing, the Rose Museum opened on the same day as the 2016 World Federation of Rose Societies (WFRS) Convention. 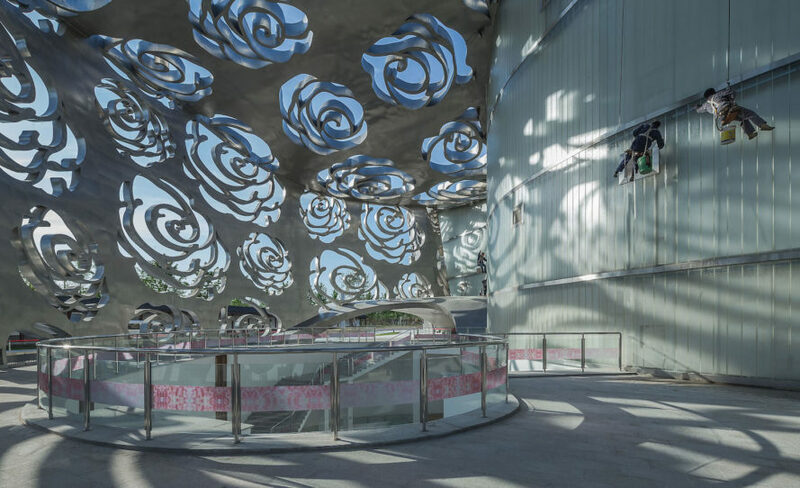 The curvaceous museum features a stainless steel facade perforated with a pattern of Chinese roses. Set on a 100-hectare rose park that exhibited over 2,000 species of roses for the convention, the Beijing Rose Museum was designed to engage and overlook its stunning surrounding views. The museum is a modern take on the historical Chinese courtyard house that embraces and encloses open spaces, as a nod to traditional Chinese architecture. To showcase the history and culture of rose cultivation in China, which dates back to at least the 11th century B.C., NEXT architects wrapped the building in a 300-meter-wide, 17-meter-tall soft, stainless steel facade perforated with rose-shaped patterns. The detached facade creates a series of walled-off courtyards. “The main challenge with the Rose Museum was to find a modern Chinese identity for a building which significance is so deeply rooted into Chinese culture,” said John van de Water, partner at NEXT Architects. The semi-transparent stainless steel walls blur the boundaries between the indoor and outdoor landscape. At night, the museum lights up from within for a beautiful glowing appearance that can be enjoyed from across a lake. Beautiful indeed, alas not the first though! Unless you mean the rose printed facades, with that - by all means. Set on a 100-hectare rose park that exhibited over 2,000 species of roses for the convention, the Beijing Rose Museum was designed to engage and overlook its stunning surrounding views. The museum is a modern take on the historical Chinese courtyard house that embraces and encloses open spaces, as a nod to traditional Chinese architecture. 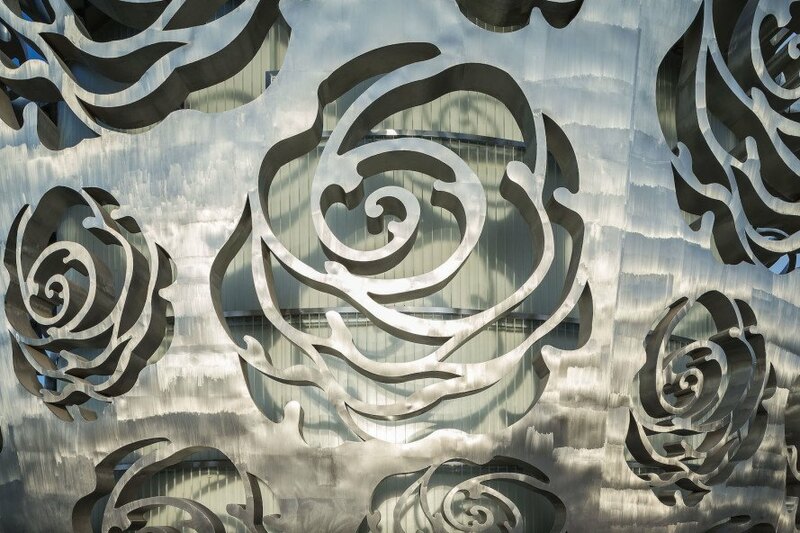 To showcase the history and culture of rose cultivation in China, which dates back to at least the 11th century B.C., NEXT architects wrapped the building in a 300-meter-wide, 17-meter-tall soft, stainless steel facade perforated with rose-shaped patterns. The detached facade creates a series of walled-off courtyards. “The main challenge with the Rose Museum was to find a modern Chinese identity for a building which significance is so deeply rooted into Chinese culture,” said John van de Water, partner at NEXT Architects.